Paul Krugman despairs while Wall Street cheers. The job of treasury secretary has never been so much fun. 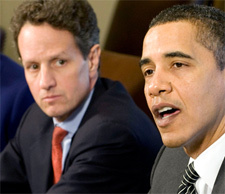 Treasury Secretary Timothy Geithner listens to President Obama during the daily economic briefing at the White House Monday. Early returns on Treasury Secretary Tim Geithner's plan to deal with toxic banking assets: Paul Krugman hates, hates, hates it. Wall Street loves, loves, loves it. At 11:30 a.m. EDT the Dow Jones Industrial Average was up around 270 points. Meanwhile, Krugman is overcome with "despair." Of course, we should always avoid putting too much stock into what the stock market thinks at any given moment. But before taking a deeper look at the plan itself, one can't help noting that the varying reactions demonstrate the historically unprecedented position Tim Geithner inhabits -- demonized by both the left and the right. Not only can't he, by definition, please everyone -- the very fact that he satisfies one side sends the other into a panic. As economic historian Brad DeLong noted over the weekend, the world is divided into "people who are strongly opposed to the Geithner plan because Tim Geithner is a socialist who wants to destroy American finance" and "people who are strongly opposed to the Geithner plan because Tim Geithner is a corrupt plutocrat who wants to give Americans' money to the princes of Wall Street." Krugman is upset because he believes that the Geithner plan will waste taxpayer money supporting unrealistic prices for toxic assets that are irredeemable junk. For him, the fact that investors are delighted just proves his point. Anything that makes Wall Street happy must be a sellout to the "wheeler dealers" who got us in this mess. On the other hand, just suppose Geithner had followed the Krugman plan, and announced the immediate nationalization of Citigroup and Bank of America on Monday morning. It's hardly a stretch to imagine an ensuing market crash as bad or even worse than what we have already witnessed. And market crashes don't just hurt the pocketbooks of the rich. They wipe out pensions and have an undeniable effect on consumer psychology. If the stock market goes down, right-wing critics declare that Geithner (and by extension, the Obama presidency) is a failure because "the market" has lost confidence in the administration. But if the stock market goes up, the left wing suspects that's only due to the unfair funneling of taxpayer money to Wall Street. If one constituency is satisfied, the other is bound to be distraught. In such an atmosphere, it seems foolish and naive to even hope for a middle path, to imagine that the joint impact of the initiatives rolled out so far by the White House -- the stimulus plan, the housing plan and now the Geithner plan -- might mutually support each other, put the brakes on the economic contraction and inject some badly needed optimism into the marketplace. Who knows -- maybe a burst of stock market enthusiasm bolsters the first-quarter performance of some 401K portfolios, which encourages some households to buy a new car or go out to dinner at a nice restaurant. Meanwhile, the historically low mortgage rates that are in part attributable to the housing plan (in combination with steep foreclosure-driven home price drops) already seem to be goosing the housing market more than anyone expected. After just two months, despair is a premature reaction. Krugman's basic thesis is that by failing to act boldly now, Obama is limiting his options for the future. But if there's one thing we know about Obama from his successful presidential campaign, it is that he is will be cautious, cautious and more cautious, until that doesn't work and it is time to be bold. He and his team have thrown a lot at the wall in just two months, waiting to see what will stick. If it doesn't work, they'll likely try something else. Whatever else one might want to say about Obama and his economic advisers, they're not dumb.